If you're looking for luxury and space, but you love the distinct style of the Volkswagen lineup, there is something for you. The comfortable and high-tech 2017 Volkswagen Touareg SUV has space for up to five passengers and is available for you at Joe Heidt Motors Corp. There's a lot to love about the stylish and capable Touareg, and we're here to tell you what's new for 2017. We've got an up-to-date online inventory and an easy online scheduling tool that makes it quick for you to check out what we've got in stock and to make an appointment to get behind the wheel. The Touareg is the perfect SUV for small families and drivers looking to add luxury and convenience to every drive. 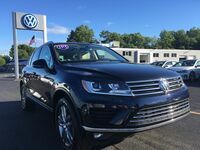 On top of the standard V-Tex Leatherette seating trim and heated front seats, the 2017 Touareg comes with a standard eight-speaker audio system, colorful first-row touch screen and eight-speaker audio system. The 2017 Touareg comes equipped with a 3.6-liter V-6 engine that puts down an impressive 280 horsepower and produces 266 lb-ft of torque. When you pair this with the eight-speed automatic transmission with available Tiptronic mode, you can take on tougher roads and drive with confidence. . There are a number of exciting standard features on the Tourareg, but for those looking to take the safety and convenience to the next level, there is Adaptive Cruise Control, Forward Collision Warning, Autonomous Front Braking, Lane Departure Warning, and several Parking Assist features.